This recipe is a best friend. No matter where you are, how you feel or who is there, you know you guys will always be best friends and that things will turn out okay. 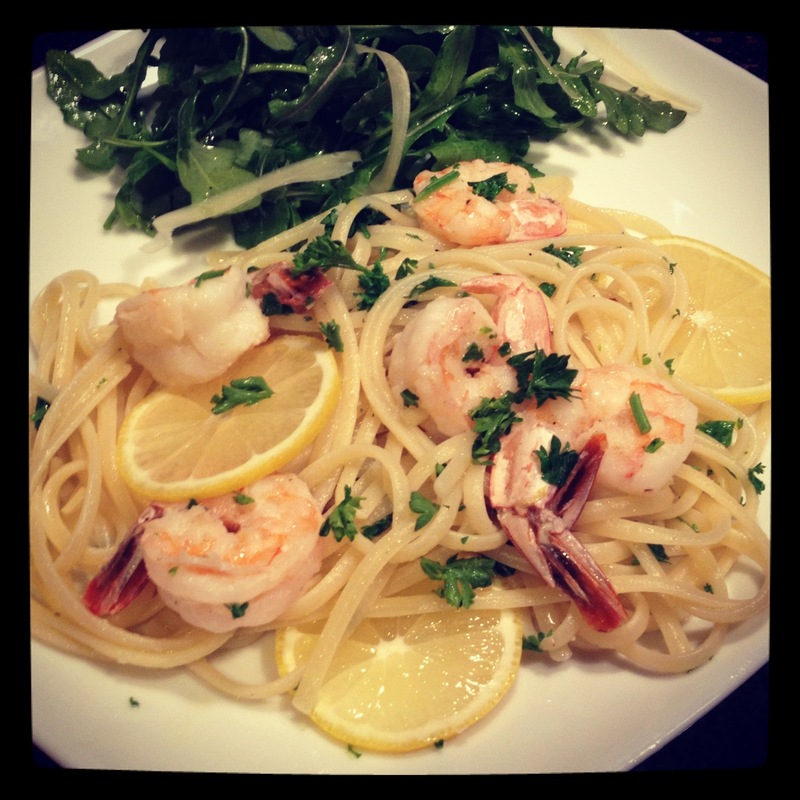 That’s what Shrimp Scampi with Linguine is- your best friend. I made it once, committed the recipe to memory, and will make it on the regs ‘til I die. You hardly need anything for this recipe. Have the butter/oil ready to go in the pan. 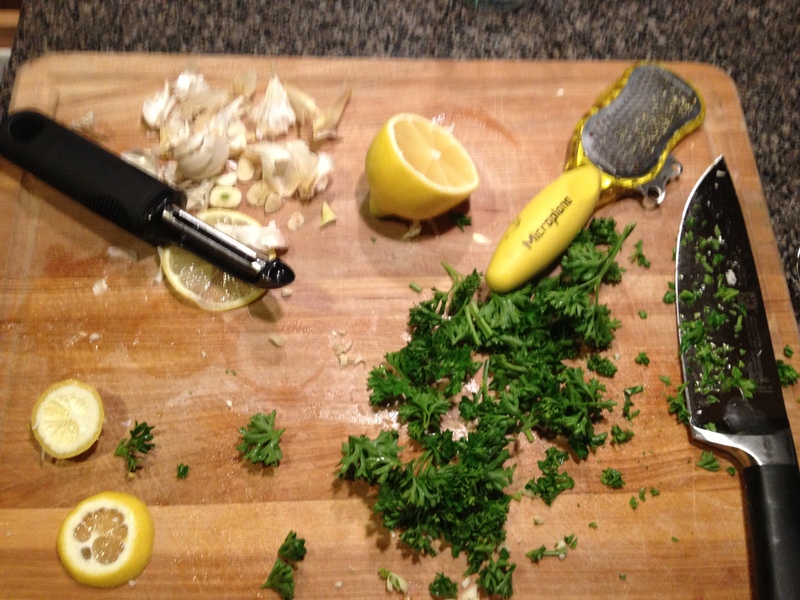 Pre-cut the parsley and garlic. Pre-zest/juice/cut the lemons. There. Now when your friends come, this will literally come together in min, no max, 10 minutes and you will look like some sort of wizard. The only expensive ingredient is the shrimp so I don’t want to hear any bitching as if this meal is unattainable you. Also- buy the shrimp peeled and deveined (unless you want to pull the intestine of the shrimp out yourself- yeah that’s what that black line is that they “devein”…mmmm). 21-25 There are no less than 21 and no more than 25 shrimp per pound of this size shrimp. The average amount of shrimp per pound should be 23. These are called “jumbo” shrimp. 16-20 There are no less than 16 and no more than 20 shrimp per pound of this size shrimp. The average amount of shrimp per pound should be 18. These are called “extra jumbo” shrimp. This is my go to size and what I use for the Shrimp Scampi with Linguine. U15 There are less than 15 shrimp per pound. The average amount of shrimp per pound should be 14. These are called colossal shrimp (yeah that seems contradictory but whatevs I didn’t pick the names). K do you get the idea? As the count size goes down the shrimp size goes up. Let’s be real, you can just pick some grab bag shrimp and it will be fine but don’t you feel better about yourself as a person now? i’m def going to make this sometime! looks delicious rana! Cait- let us know how it goes!